Open the Project you would like to duplicate. You will be notified that the project has been duplicated and is ready to work on. Note: Your duplicate project will have have the same project name, appended by ‘(duplicate)’. To duplicate a Master course, open the Master Course you would like to duplicate. 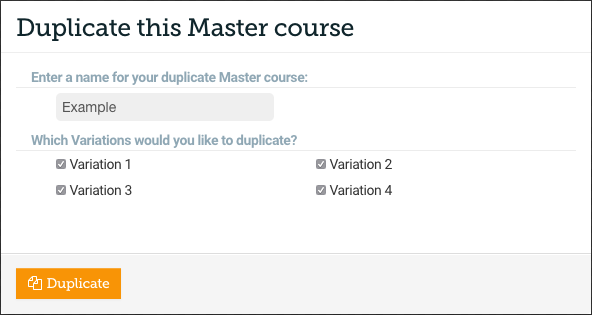 …here you will be able to give your new Master course a name, and you will able to choose which Variations you would like to duplicate also. The duplicated Variations will be connected to the duplicated Master course.